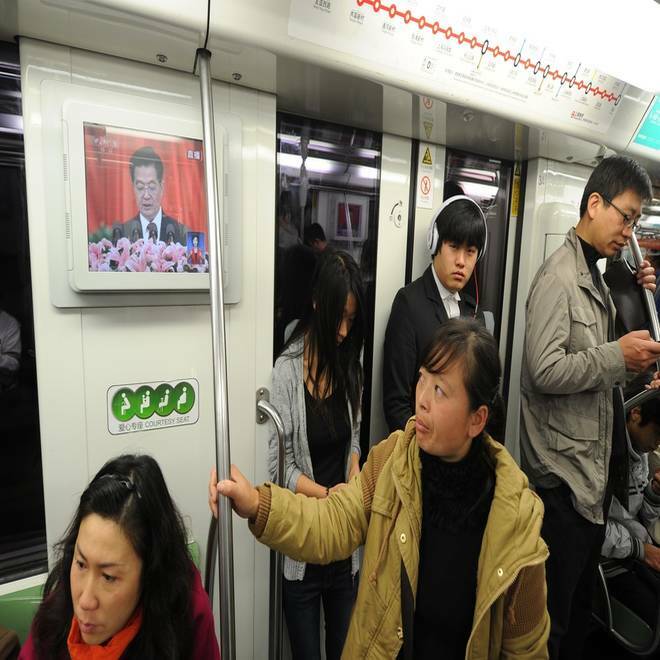 Chinese President Hu Jintao is seen speaking at the opening of the 18th Communist Party Congress on a television in a subway train in Shanghai on Nov. 8. “Are you watching?” I asked my driver on the way in from the airport. He looked at me and laughed. “Why would I watch that?” he replied. A little later I settled down in my hotel bar over a glass of Great Wall cabernet sauvignon. “Are you watching the Congress?” I asked my server. Again that quizzical look. “Oh, I don’t care about that,” she replied, before slipping behind the bar and resuming whatever she was doing on her mobile phone, which judging by her concentration she did care about very much. 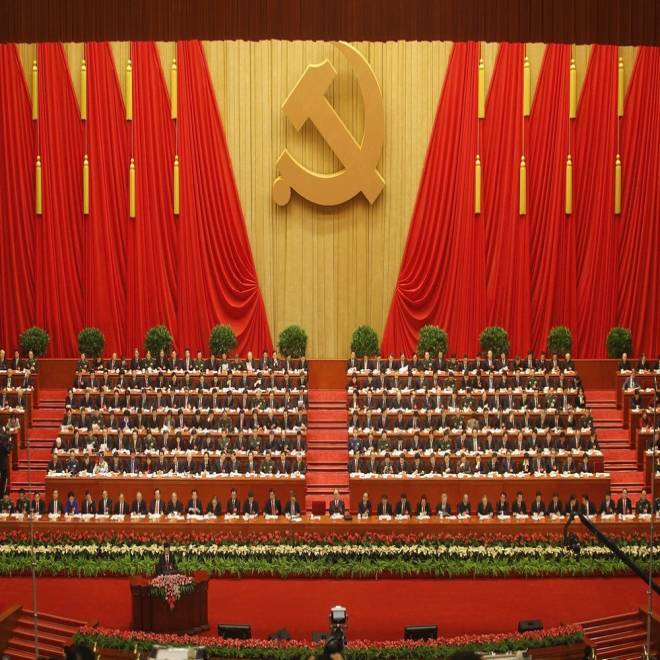 The 18th Congress of the Communist Party of China (CPC) has begun with great pomp and ceremony in the Great Hall of the People on Tiananmen Square. It is important -- a once-in-a-decade leadership change at a time when the country is facing enormous challenges, from a faltering economy to rampant corruption that goes to the core of the party. But among many Chinese, away from the stuffy heart of this city (from which carrier pigeons have been banned, incidentally, as a security precaution), the meeting might as well be taking place on the moon, among green aliens with spiky heads. That's how relevant it seems to them. The official media has given it blanket coverage, while at the same time trying to limit discussion in China's vibrant social media -- slowing internet speeds and even blocking the Chinese translation for the 18th Congress from search engines. Aside from the pigeon ban, taxis are required to keep their back windows locked, presumably to prevent the distribution of subversive pamphlets, and tiny remote-controlled aircraft have been outlawed. 24 hours after President Barack Obama was re-elected to the White House, the world's other major power, China, began the very different process of choosing its new leader. It happens once every ten years, and lasts just a week. And in case there was any doubt, the ruling Communist Party began by pledging never to have Western democracy. NBC's Angus Walker reports. Still, the party “will continue to inject vigor to national politics,” declared the Global Times at the weekend. “Vigor” isn’t the first world that comes to mind when you see the line up of gray men (you’ll be hard pressed to find many woman near the top of the CPC) in gray suites, gathering mostly to dutifully endorse decisions already made. Much of the proceedings are behind closed doors and the main qualification for advancement in the party is to not the rock the boat. Opinions are dangerous; flamboyance can be fatal to a career in the CPC. The party is expected to use the highly orchestrated event to persuade the nation's 1.3 billion people that it can provide another 10 years of economic growth and social stability while curbing corruption and nepotism. The report from the retiring party boss and head of state, Hu Jintao, which kicked off the Congress, hailed as a masterpiece by Chinese newspapers, was of such length and mind-boggling tedium that initially it left analysts struggling to figure what precisely whether it was reformist, reactionary, liberal or conservative. Just ahead of Congress, I had embarked on a journey across the Beijing to test opinion. It was hardly scientific, but I figured I'd at least get a sense of what ordinary Chinese were thinking. I started by bike in the narrow alleyways around the surviving hutongs in an older part of the city. Here the residents are older too, and a question from a foreigner about the Communist Party, produces an embarrassed wave of the hand, or provokes a speedy retreat behind closed doors. Ordinary Chinese of a certain age have seen how capricious and brutal the party can be and know better than to openly discuss politics with a foreigner. An exception was an elderly man who stood bold upright and recited how China's new leaders would build a strong and prosperous country. But what of Xi Jinping, the man soon to be anointed leader. What does he stand for, how exactly will he do that, I asked. The door swung open and he too was gone. I approached a man barbecuing some skewered lamb. He claimed not to understand my interpreter, though did I detect an extra touch of aggression with those skewers at the mention of the party? I then took a taxi figuring that cabbies everywhere have an opinion. But not this one, shaking his head, waving his hand, and probably wishing his wheezing vehicle had an ejector seat. I pressed on. I know what President Obama listens to on his iPod, I explained, and what Mitt Romney has for breakfast. Did he think Xi Jinping has an iPod? At that he just burst out laughing, and laughed, and laughed, until he dropped me at a Beijing university, where my luck changed. Here almost all the youngsters I met had heard of Xi, but professed to know hardly anything about him. What does he stand for? Two young women looked blankly at each other. "We don’t know," they said in unison, as if this was the most stupid question they'd ever heard. Does Xi have kids? I asked another couple. "I don't know," said one. "And I don't care." said the other. Another young man looked puzzled. "But we don't vote," he said, which I guess goes to the heart of the matter. Why should we care, he seemed to be saying, what's this process got to do with us? Perhaps out of desperation, I did what a lot of Beijingers are doing these days and went to a fortune teller. He rumbled me immediately, and declared that he didn’t do politics, and that his crystal ball certainly didn't stretch to the Communist Party. "I don't know and I don’t care," he declared. The party, at least its more perceptive members, do seem to recognize the challenges they -- and China -- face. But the prescription for these ills appears to be more of the same. Its still a brave and lonely voice that will call for greater openness, transparency and accountability. The congress will end with the unveiling of the new leadership. Yet in spite of acres of fevered analysis from China-watchers, the reality is that we know virtually nothing about what Xi Jinping thinks about anything, let alone the secretive process by which he was selected. Is he another grey and cautious techocrat or a closet reformer? Take your pick. We can all be experts in the face of the party's secrecy. On paper at least the Communist Party has 82 million members, but only a tiny clique make the real decisions, and there is an enormous gulf -- vast and growing -- between them and the people it is supposed to represent, a gulf filled increasingly with cynicism and distrust. 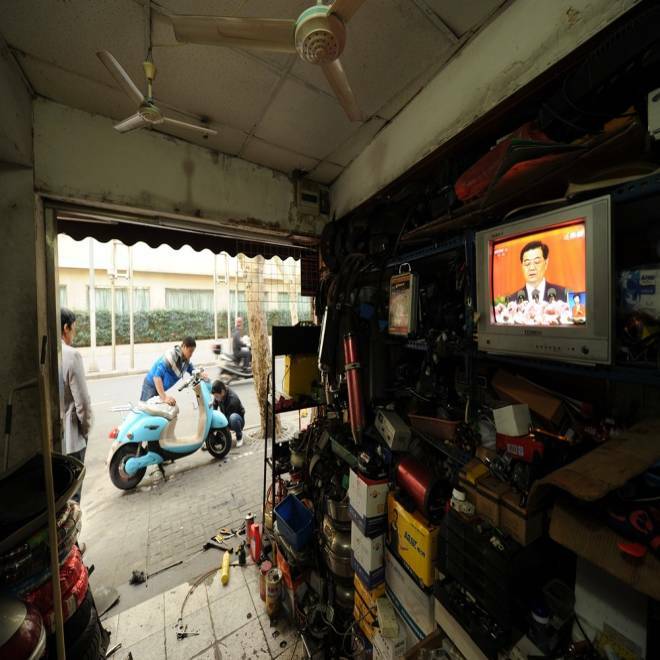 President Hu Jintao, seen on a television in a motorcycle repair shop in Shanghai, called for stepped-up political reform and a revamped economic model as the Communist Party opened a historic congress to usher in a new slate of leaders. China has changed dramatically since the party last changed its leaders a decade ago -- from the economy to the thriving social media that's such a thorn in the side of the leadership, and where the timing of the leadership change, so soon after the raucous U.S. election has provoked many an uncomfortable (for the party) comparison. The dynamism elsewhere in China is in stark contrast with the ossified spectacle on display this week in the Great Hall. Those carrier pigeons are the least of the party’s problems.